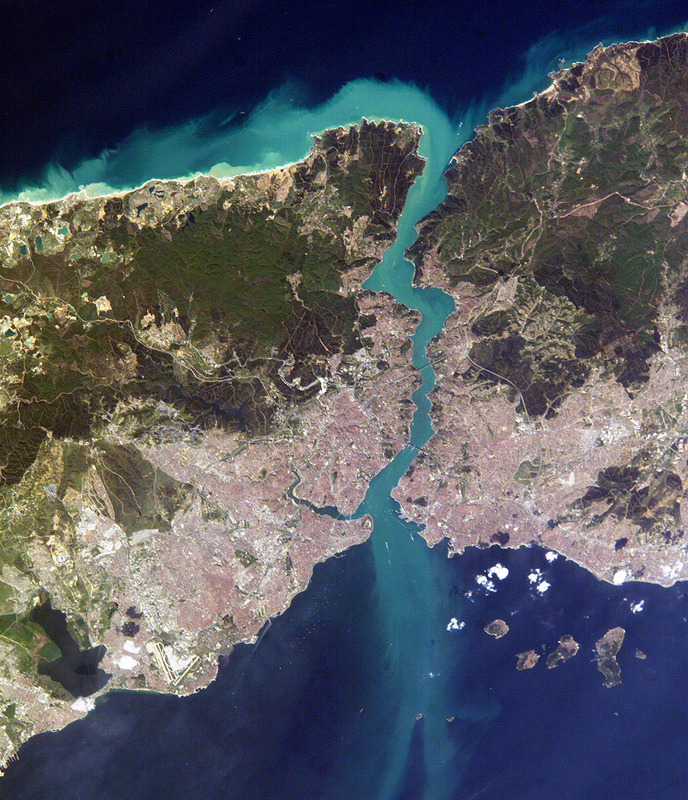 We explore the capital of the Byzantine Empire: Constantinople. We look at the origins of the city and trace its development from Greek city to Imperial centre. Then we see why it had such a strategically valuable location. After that we visit the city itself in the 6th century from the Great Palace to the streets. 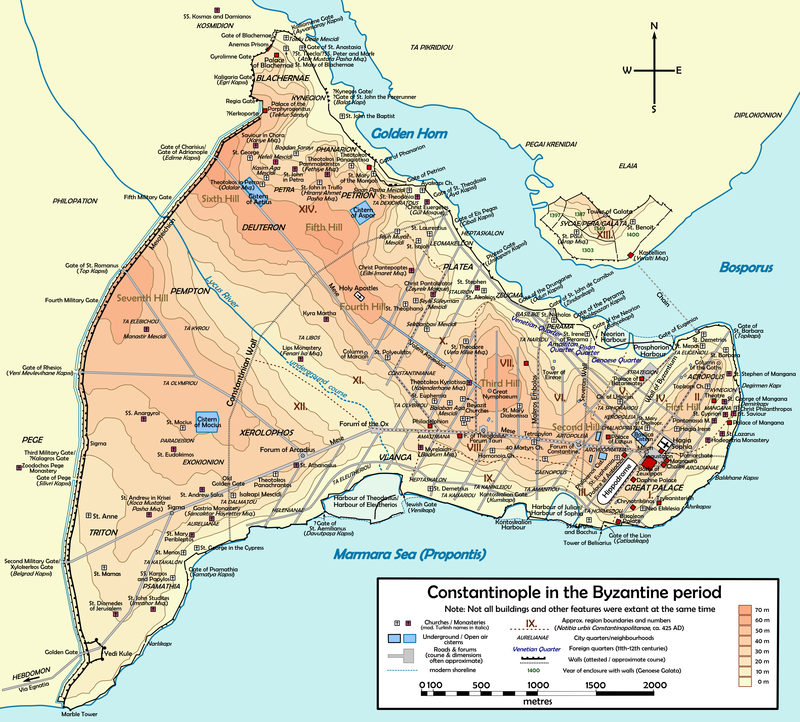 Map: The map below shows Constantinople during the Byzantine years. You can revisit this map in the future as it will be relevant throughout the life of the podcast. After a bit of googling after listening to this episode I stumbled across this paper: “The Triumphal Way of Constantinople and the Golden Gate” by Cyril Mango (here -http://www.doaks.org/resources/publications/dumbarton-oaks-papers/dop54/dp54ch9.pdf/view). Lots of interesting detail to supplement your continuing “walking tour”. Anyone else having trouble downloading? Ive been waiting for this episode for a while now and I cant download it! Is it something on my end or what? Nevermind. I got it working. Great episode as usual. I really enjoyed the the attention paid to all the little details. Thank you! Having listened to the first ten episodes, I only wish you could quit your day job and move to a rainy dessert island with internet conection. This is a great podcast and a worthy companion to the History of Rome. And that is the best compliment you can get. As I was listening and searching for actual depictions of buildings I stumbled across a site showing the buildings of the city circa 1200. Great job with the podcast! Im sorry burn the links do not work. @ Francisco – you are very kind. Glad you’re enjoying them. really enjoyed this episode but looking on the map i see a gate on the harbor of theodosius named the jewish gate. anyone have any idea whats the story behind that? Good question 🙂 The Jews of Constantinople tended to live in the same area of the city. Over the centuries this enclave was moved. From a brief scan I can see references to Jews living near the supposedly named “Jewish Gate” but those references don’t suggest it was near the harbour so not sure about this. This map is not specific to one time though and hence multiple names for certain gates or areas. If you would like to know more about the Jewish community in the city then remind me when we come to question and answer podcasts at the end of the century. Excellent podcast. I can really picture Constantinople in my head. An amazing city, if only I had the resources to make a movie that would be grand. I am new to this podcast and this is my first episode. 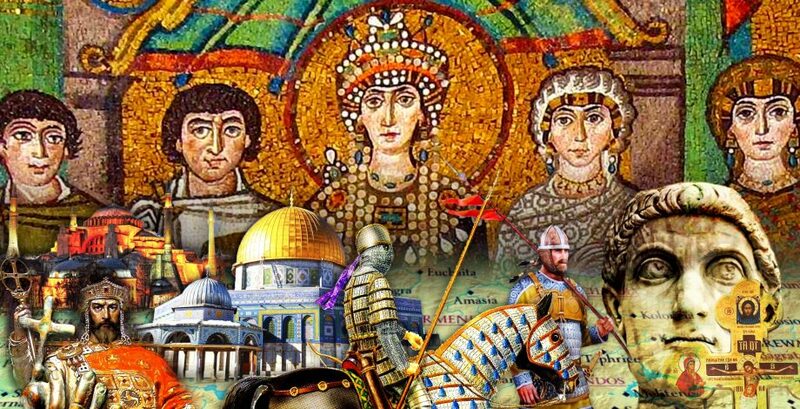 I got interested in the Byzantine Empire after watching the Real Crusades History videos on Youtube and I just finished Charles Omen’s History of the Byzantine Empire. Hopefully these podcasts would be a great adventure. My name is Malcolm. I’m five. My dad had your show on in the car. I liked it.